I am grateful to my clients that have supplied a testimonial. Healing sessions can be very personal so when a client offers a testimonial, it is very much appreciated. In some cases, the following clients have offered to be references so if you would like to contact them regarding their experience, please let me know. If they have made this offer, I will forward you their contact information. "Once again Sundi, and her special talent and gifts, have helped to alleviate physical pain that has been with me for some time. Pain that I had tried to get rid of through many chiropractor appointments, but with no success! I was really starting to believe that I would never get better, but after a session with Sundi, she was able to get to the root cause and all of the pain has just fallen away. Sundi is so professional, kind and understanding and has been a God Send to myself and my family - thank you Sundi xxxxx"
"The problem I wanted Sundi to help me with was a desire to transform my current unhappy, unfulfilled relationship with a married man into My desired outcome to claim my power back and live in my truth. Once I completed the detailed, thought provoking questionnaire, I felt lighter. It felt like, because I was describing what I didn't want in detail and then describing what my desire was, I was creating an alternative environment for my mind to shift into and the energy around the problem began to transform. My reading was exquisitely detailed and packed with truth that has provided an open doorway for me to walk through. When reading it I only felt true love power and light to the highest degree. I liked how Sundi suggested the ho'oponopono as that is one of my favorite tools in my tool box and I had been using it a lot in the past week". I completely resonated with the reading. I immediately noticed that I felt empowered. I felt empowered to make the changes that I had longed to make and yet felt stuck and unable to make. I felt like, honestly, it is all old news, a matter that is now in my past and forever gone. Today, a few days later, it feels like a movie that I had once watched long ago that I am very unattached to. I can look at it and not have emotion tied to it. Its not me, is how I feel. I moved on. AND, I moved on with total ease. No more angst, just matter of fact, like its a no-brainer, like, I no longer wish to go to the restaurant anymore because I no longer like the food it serves. Like that! Secondary benefits have been a feeling of peace and relaxation within my body. Lightness, Laughter, Love and Joy! As a result of the reading/healing, the sadness perspective I had over my situation changed. I no longer perceive my world as being sad, unfilled, unhealthy, and the guilt of claiming my power back is all gone. I used to feel really guilty when I would want my power back and I would feel his sadness in that I was taking away from him and so I felt I could be stronger without it so I wouldn't take it back and I would leave it to help him be strong, and yet, that always made me sad; obviously. and now, Sundi, cleared all that up and out of my energy and she replaced it with what feels like an even greater power. Pure and light and total love. I no longer carry the resentment of my choosing or the guilt of choosing differently. Its loving and peaceful and right. From the bottom of my heart, Thank you, Sundi!" I want to preface this testimonial by saying that I might not have believed what I was seeing had I not taken Doreen Virtue's Realm Reader course. Although I don't necessarily do a realm reading the way she has taught it (because my client's are all over the world and I don't see them in person), it did open my eyes to the different realms that people may originate from. Even then, I should my head and rubbed my eyes and looked again! And saw the same thing! "I contacted Sundi for eczema. I felt a lot of desperation and sadness when I was searching online for help, but I was very drawn to Sundi's site! And for good reason! After I submitted the questionnaire I noticed I felt more at peace like everything was unfolding the way it was supposed to. The reading was so much more than I could have expected! Sundi is very guided and she trusts her guidance and that trust eased a wonderful reading. She had profound insights into the reason my skin manifests the way it does. She even found that I was an incarnated mermaid, believe it or not! I was a little skeptical at first, but then I had too many signs of validation to ignore it. The most recent (of many validations) was I went to the beach as Sundi suggested I do to enable that part of myself to flourish, and we took an umbrella down to the beach we had lying around in the car. The umbrella's design was all mermaids! My skin has been continuing to improve. I felt a huge relief and a peace that it will keep healing too. I am so thankful for Sundi's work. The improvement in my skin has been very drastic. The turnaround has been incredible. My skin went from weeping and rough to smooth. I feel myself radiating health from the inside out now more than ever. And I am confident it will keep going in this direction. Secondary benefits are that I am more patient with myself and likely to look at things from multiple perspectives, instead of just feeling limited by my own. This is a sense of generosity and expansiveness that I am growing into every day (another insight helped along by what Sundi saw and articulated to me). My perspective is much different now. It is a shift from seeing something as "wrong" with me and a shift into loving life for what it is teaching me as one continual lesson of love. "Having found Sundi on-line, I was instantly drawn to her and found her website and words comforting. My daughter had been suffering from a very dry and scaly scalp, which was causing her a lot of distress. Sundi responded to me quickly and efficiently. She was kind and very understanding and was able to accommodate our healing session quickly. Immediately after the session, as promised, a very detailed report was received from Sundi. This was so informative and really helped us understand and see things from a different angle. Being located in the UK our session was done remotely, but immediately we felt the change and shift in the energy around us. We have had a follow-up session and since then my daughter's scalp has improved so much, and this is really the first time that it has been clear for a very long time. Thank you Sundi - you have an amazing gift and we are so pleased we found you......"
This testimonial is an email I received after an offline, short session I did for a client who's "problem" was being financially behind. It's a good example of how if you look at the problem in a certain way, you will definitely experience it that way. "Hi Sundi, Oh my gosh - this was AMAZING!!! I can't believe you picked up on all of that... my "debt" is 98% my student loan (which I used to fund my B.Sc and PhD)...so when you mentioned "bringing it forward", and that the debt is actually a benefit, you are SO right!!! I never looked at it that way, and yes, we did a move last year that was quick and did uproot us, but we are definitely in a place now more suited for our growth. Again, I can't believe you picked up on the move as well, I am completely not only impressed, but blown away by your accuracy. I have to confess I did a short session because I've had other "readings" where they are nothing like yours and I felt like with those ones, they really weren't as skilled, so I was a little skeptical and thought a short session would be a good compromise. Well, thank you for completely proving me wrong!! I'm definitely going to get in touch with my babysitter and schedule another session with you, I completely understand the time frame was more limited here and there's only so much that can be said in such a short time. Really, really, REALLY looking forward to connecting with you again and thank you so much for your amazing work!!! " "I contacted Sundi in regards to the food and seasonal allergies I had been experiencing. Immediately after my session, I felt lighter, and my breathing was easier. I truly believe I no longer have any food allergies. I also feel like my seasonal allergies are less severe and will in fact disappear altogether. In addition, I have been repeating an affirmation that developed out of my session and I am noticing that my communication is easier, clearer and better received. My relationship with my spouse is improved, also because I have been performing the HAMR technique which I learned about in Consciousness 101." "I contacted Sundi for a cellulite problem that had been increasing over the last couple of months. After the second session with her, during which we went deeper into the points she discussed in her first reading, I felt a lot of relief. I came to many realizations and it felt as if things were finally making sense. Sundi was able to describe in detail several events that happened in my life that I had not been able to recall due to their strong emotional impact. The details were accurate and she was able to clearly point out how those events had been having an impact on my self-esteem, my relationships and were causing several physical issues. Around two days after our session, the cellulite started to disappear. Now, two weeks after our session, the cellulite is almost completely gone and I am convinced that I will soon have the smooth legs I desire. In addition, I am feeling calmer and more confident. I have been able to let go of many negative beliefs I had been holding for years. The relationship with my father has also improved, I feel like things have finally fallen into place and I am finally understanding the root of many insecurities and fears I had been having for many years and I have now been able to let go of them. More than ever, I now realize how our conscious and subconscious beliefs and thoughts are affecting our physical health. Before the sessions with Sundi, I thought I had let go of most of the things from my past, and I felt good, I was happy. But I would just have to look at my body and realize that there were deeper issue that were still causing some imbalances in my body. Sundi was able to uncover those unsolved issues from my childhood which I am very grateful for as I have now finally been able to let go of the past and get rid of many negative beliefs I had been holding for a long time." "I contacted Sundi because I was experiencing excess weight on my thighs. After I submitted the form I noticed a lot of anxious energy started to shift. So many of the symbols that Sundi saw resonated with me and immediately made sense, even though I'm sure for Sundi they were very off of the wall! The symbolism described what has been on my mind right now, and well as the problem I was facing, along with symbolism of my past events which had led to the problem. She cleared and healed out all of that energy. Later in the evening after my healing session, I was just sobbing so so much and felt this release afterwards like I was at peace in that moment, so I remembered Sundi's email where she said for the next few days I may experience release that is uncomfortable. It was uncomfortable but I let myself feel it and while I was feeling it, I told myself that I acknowledge that part of me who feels that way and I love that part of me, and that it's okay. Then the morning after, I noticed my pants are MUCH looser in my thighs (my original issue being excess weight in my thighs)! I mean wow!! As for the emotional reason for my physical problem (which was people pleasing behavior and changing myself to fit others), I became different at work. I was speaking my mind in ways I don't normally do. I was saying what I knew was morally the right thing for the team to do, regardless of whether I thought I would receive backlash. It just didn't matter to me anymore. I felt like I was allowed to have my voice heard and not care what others thought about it, which is usually difficult for me. And when I went about taking a stance for how I feel, I actually did not receive backlash at all, like I am usually so afraid of. My management thanked me in fact for speaking up and are now taking actions to correct what I have observed. So overall I'm feeling much more empowered so far! Although I am noticing my physical problem seems to be clearing up, I am more-so seeing the benefits of the emotional reason behind my physical problem being healed. I am very confident in what I want and not bending over backwards to people please. I am saying how I feel and speaking my truth, which is what Sundi said I am here to learn in this lifetime - to love myself first. I knew deep-down I was a people pleaser, but I definitely didn't realize the extent to which it was affecting all areas of my life, and just how deeply that effect was." "I have contacted Sundi for a few different issues. Feeling stuck with extra weight, with a specific concern about extra weight in my chest. Many women go through these feelings. After getting healing done, Sundi really helped changed my outlook towards the positive regarding my body. I am still working through concerns in my chest area, but my extra weight has fallen off, it is now stable and I am overall happy and do not look at food with helplessness anymore. Doing these sessions while being a breastfeeding mother, one of the most positive benefits I have seen about energy healing in my chest has been a noticeable increase in the milk needed for my child. I know many women struggle with feeding their child. Either the breastfeeding relationship or needing enough milk to continue feeding the baby. This was not a request of any of my sessions with Sundi but it was a super exciting outcome! I noticed it after EACH time I talked with her. Overall, I would say to try a session with her. There is noticeable change. To me, you can either pay a lot for multiple sessions with a therapist, or a session with Sundi. Sundi is the next best thing to a therapist/great listener/asking the right questions, with an additional benefit of energy healing. To me, this can't be beat and I recommend it to the very close people in my life!" "The physical problem that I contacted Sundi about is cellulite on my thighs. Beyond that is my having so many work responsibilities that I feel frantic and torn between what I want to be doing and what I am doing... my bumpy path showing up in my bumpy thighs [Annie’s thoughts although not was I saw as being a more prominent contributor to the problem]. After I submitted the questionnaire, I had this feeling of relief and a feeling that I was being cared for and protected. I felt more relaxed and contented. Sundi did my session off line as I was at work. In the morning I awoke and when I got up I stretched, reaching high up and standing on tip toe. I never do this, but I did and as I did, I felt like a huge breath was coming into me. I felt calm, relaxed, right with the world. I paid more attention to the work I was doing in the moment. Usually I am pulled so many ways I am not present with where I am. Then I received and read Sundi's notes on the session she had done on my behalf. I think that giant breath I took was incredible - having that much air in me felt foreign and shocking. and I'm sure it happened while Sundi was doing my session for me. I also resonated very much with the reading! Sundi brought up things that I had not revealed in my questionnaire but that were astonishingly accurate. I was shocked and awed by her insights into what I had left unsaid. She gave me an affirmation that resonates amazingly. The affirmation she gave me - "I AM in control of who does what, if anything to me and I CHOOSE to only be nurtured” resonates so strongly. Also, she said that focusing on the “problem” is an obvious way to create more of it - that was an eye opener! When Sundi searched for the inciting incident, the images she received were surprising to me... they were accurate to my history but I had no thought that they were connected to the problem so this was revealing. As a result, I feel revealed in a way after the session - in a safe way, like comfort. I feel relief and awareness... more awake." Whenever I feel any self doubt I use the victorious affirmation and it helps enormously to be able to begin trusting. I also began to notice I felt angry when I sense being judged as a lesser human being (this has been something I've struggled with for a long time and didn't know how to shift) and when I held it with the understand of the cinderella past life experience [I saw this as her scrubbing floors and having a forceful energy standing over her] it allowed it space to just be what it is without me hooking into it so much. "My relationship with Rick [had experienced] a sudden & unexpected change in our relationship. For more than a month Rick & I had not spoken. 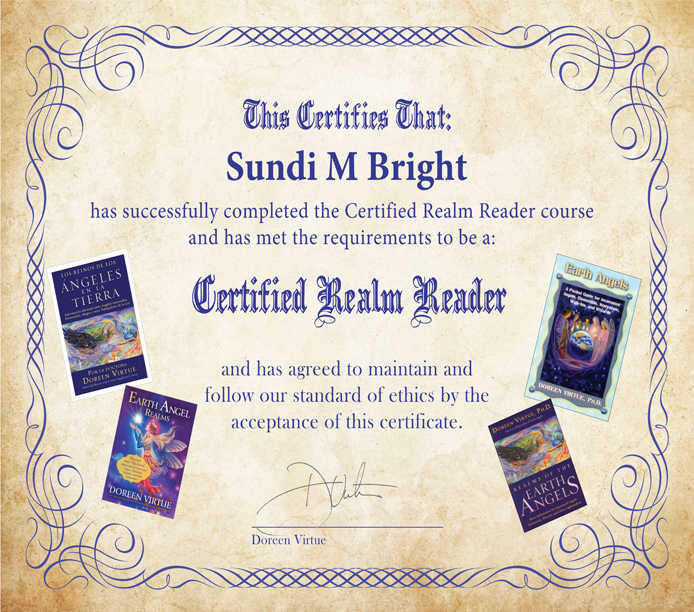 "The reading with Sundi resonated with me right away. I noticed my energy shift even before the reading. I read over her report several times & and more & more is revealed to me as time goes on. Immediately after the session, I felt lighter and peaceful as I was open to the healing. In addition, two new exciting opportunities came up for me within a day and I found myself more confident. "My issue was 3 weeks of coughing and sinus issues. On the day of my session, I woke up from a nap, breathing clearly with no cough. I checked my email and found that Sundi had done my session while I was sleeping. "My 16-month-old son had been constipated for months, was clingy and under significantly visible distress because of it. I consulted our chiropractor, naturopath, pediatrician, and acupuncturist for help with constipation. I did not think they were taking the situation seriously enough. My perspective changed because I learned that there was a dark, negative energy surrounding my son. No amount of dietary changes or chiropractic adjustments would have addressed that!He had a significant bowel movement the evening of his reading. In addition, he is happy, silly, and adventurous. "Sundi has illuminated many important key pieces of information that have unlocked the doors to a greater perspective and understanding in my path and spiritual progress. The readings got at some very strong images that resonated sometimes to tears. "My concern was the cellulite I have adopted over the years, "out of nowhere." I was told my reading would be done on a Tuesday. Monday morning I awoke refreshed & off to the beach I went. "Hmmmmm" I wondered, "my cellulite is disappearing & I see definition in my legs I have not seen in years, hmmmmm." I returned home to an email from Sundi, she did the healing Monday! I was amazed!!! "Sundi has an amazing gift. With this reading she picked up on issues from years back that I had forgotten about. She got ages and issues 100% correct. She even pinpointed areas on my body that I hadn't specifically mentioned that I had longstanding concerns with. Overall I am so pleased and she brought me a wonderful sense of relief that I truly can and will get better. Immediately even after our intro session, I had feelings of happiness and relief that I have not experienced before. I also had feelings of strong 'shooting' chills throughout my body, something I have never felt before - so I knew without a doubt that something substantial was happening. "My name is Manu and I want to say that I was blown away by the speed, effectiveness and depth of the experience with Sundi’s session. The first effects were INSTANT, right after filling in the form and the greatest result I got on the FOURTH DAY! Today is the 16th day since I applied for the session and things are getting better over time." [Manu's story of fun and romance] "
"The night you worked with Christy's energy patterns, she woke herself up and went to the bathroom. ...(more detail)... I also notice that it was as if a layer of fear had lifted and she was much more comfortable with her physical presence. I also sense a bit more confidence about her." "Thank you so very much for helping me yesterday. Today was excellent! I even talked to my mom after class today and told her why I was in sacramento and she totally supported me [when she never had in the past]. We had a great conversation!